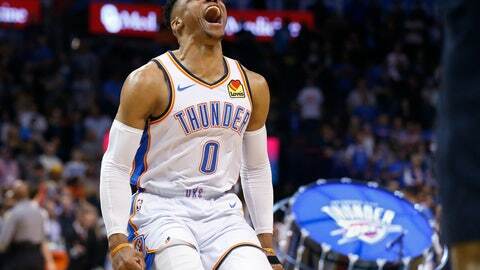 OKLAHOMA CITY (AP) — With the outcome all but decided and just over a minute remaining, Oklahoma City Thunder coach Billy Donovan wanted to get Russell Westbrook out of Tuesday’s game. Lakers coach Luke Walton said his team narrowed in on three keys to beat the Thunder, even with his own depleted lineup — transition defense, taking care of the ball and boxing out. After Westbrook clinched the mark, grabbing the rebound on Lance Stephenson’s miss in the final minute, he drew a large ovation from the crowd before leaving the game for Diallo. “We told our guys, he’s a rare player — he’s not a one-man, stay in front (player),” Walton said. “It takes two, three guys walling him up. We were OK giving up jump shots, even if they hit them, to anyone but Paul George. So if you weren’t guarding Paul, we should’ve been in the paint.